In this article we will learn about different types of turbine. The turbines are of basically four types and these are water turbine, steam turbine, gas turbine and wind turbine. We will also discuss here what is turbine, main parts of turbine and working principle of a turbine. A turbine is a mechanical device which extracts energy from a moving fluid and converts it into useful work. The turbines are basically used to produce electricity. Nozzle: It guides the steam to flow in designed direction and velocity. 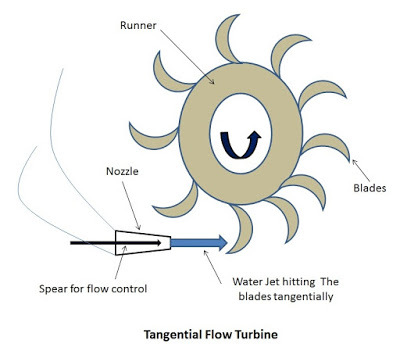 Runner: it is the rotating part of the turbine and blades are attached to the runner. Blades: It is that part of the turbine on which the fast moving fluid strikes and rotates the runner. Casing: It is the outer air tight covering of the turbine which contains the runner and blades. It protects the internal parts of the turbine. A fast moving fluid (it may be water, gas, steam or wind) is made to strike on the blades of the turbine. As the fluid strikes the blades, it rotates the runner. 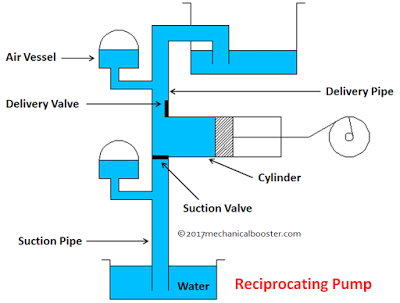 Here the energy of the moving fluid is converted into rotational energy. A generator is coupled with the shaft of the turbine. 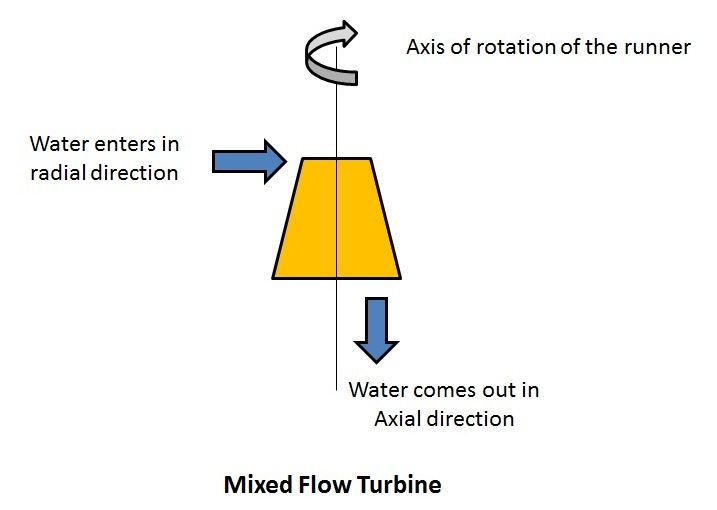 With the rotation of the runner of the turbine, the shaft of the generator also rotates. 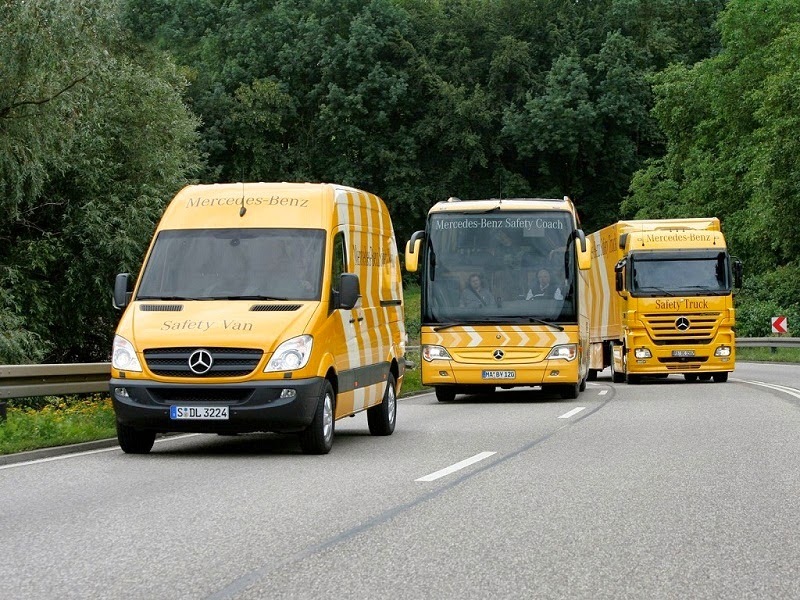 The generator converts the mechanical energy of the runner into electrical energy. 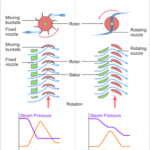 Here the same working principle that is discussed above is applied to all types of turbine. A turbine that extracts energy from moving water and converts it into electrical energy, is called water turbine or hydraulic turbine. 1. According to The Type of Energy Available at Inlet. (i). Impulse Turbine: If the energy available at the inlet of the turbine is only kinetic energy, the turbine is known as impulse turbine. (ii). 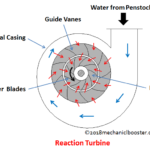 Reaction Turbine: If the energy available at the inlet of the turbine is kinetic energy as well as pressure energy, the turbine is known as reaction turbine. (i). Tangential Flow Turbine: If the water flows along the tangent of the runner, the Turbine is known as tangential flow turbine. For Example: Pelton turbine. (ii). 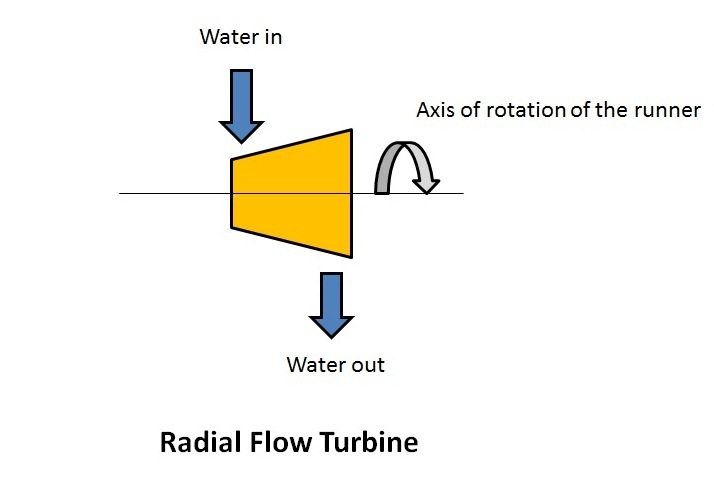 Radial Flow Turbine: If the water flows in the radial direction through the runner, the turbine is called radial flow turbine. (iii). 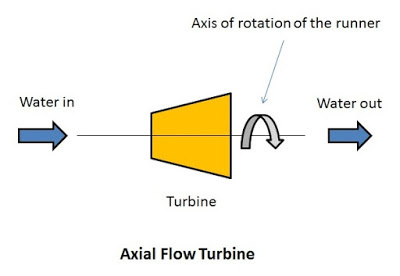 Axial Flow Turbine: If the water flows through the runner along the direction parallel to the axis of rotation of the runner the turbine is called axial flow turbine. (i). High Head Turbine: The net head varies in this turbine is from 150 m to 2000 m or even more. It requires small quantity of water. Eg: pelton turbine. (ii). Medium Head Turbine: in this turbine, the net head varies from 30 m to 150 m. It requires moderate quantity of water. 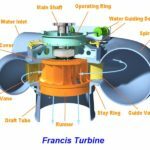 Eg: Francis turbine. (iii). Low Head Turbine: In low head turbines, the net head is less than 30 m. it requires large quantity of water. 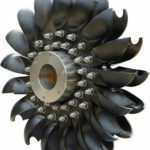 Eg: Kaplan turbine. (i). Low Specific Speed Turbine: it has specific speed less than 50. Eg: pelton turbine. (ii). Medium Specific Speed Turbine: The specific speed varies from 50 to 250. Eg Francis turbine. (iii). High Specific Speed Turbine: The specific speed is more than 250. 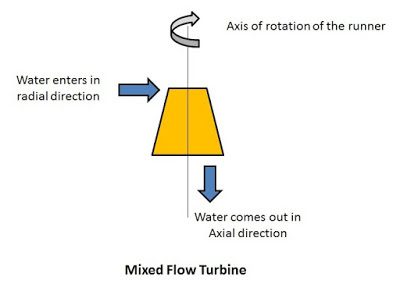 Eg: Kaplan turbine. A Turbine which extracts energy form the moving steam and converts it into electrical energy, is called steam turbine. (i). 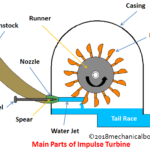 Impulse Turbine: If the steam available at the inlet has only kinetic energy, the turbine is called impulse turbine. (ii). Reaction Turbine: If the steam available at the inlet has kinetic energy as well pressure energy, the turbine is called reaction turbine. (ii). 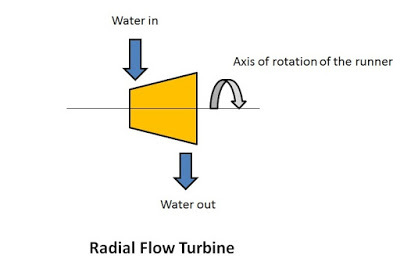 Radial Flow Turbine: If the steam flows through the runner in the radial direction, the turbine is called radial flow turbine. (i). Condensing Turbine: A turbine in which the steam is condensed, when it comes out of the turbine is called condensing turbine. It produces large output with single unit. (ii). Non-Condensing Turbine: In non-condensing turbine, the exhaust steam leaves the turbine at atmospheric pressure or low pressure. There is no condensation of steam takes place in this turbine. (i) Single Stage Steam Turbine: In single stage steam turbine, the steam after leaving the nozzle, impinges on one end of the blade, glides over the inner surface, leaves the blades and exhaust into the condenser. (ii) Multi Stage Steam Turbine: In multi stages turbine, sometimes the steam after leaving the moving blade is again made to flow through a fixed blade ring and again impinges on second moving blade. Here the fixed blade ring is used to make the steam to flow at a desired angle. In multistage steam turbine more than one set of rotor blades are used. A turbine which extracts energy from the hot moving gas and converts it into electricity, is called gas turbine. (i). Closed Cycle Gas Turbine: In closed cycle gas turbine the, the air (gas) is continuously circulates within the turbine. (ii). Open Cycle Gas Turbine: In this types of turbine, the air is not circulates continuously within the turbine. The air after flowing over the blades of the turbine exhausted in the atmosphere. (iii). Semi-Closed Gas Turbine: As the name indicates, the semi-closed gas turbine is the combination of both the turbines, one working on the open cycle and the other on the closed cycle. (i). Constant Pressure Gas Turbine: A turbine in which the air is heated at constant pressure in the combustion chamber is called constant pressure gas turbine. (ii). Constant Volume Gas Turbine: A turbine in which the air is heated at constant volume in the combustion chamber is called constant volume gas turbine. (i). Horizontal Axis Wind Turbine (HAWT): A wind turbine in which the shaft of the turbine is horizontal to the ground is called horizontal axis wind turbine. In other words if the axis of rotation of the turbine blades are horizontal to the ground than it is known as horizontal axis wind turbine. (ii). Vertical Axis Wind Turbine (VAWT): A wind turbine in which the shaft of the turbine is vertical to the ground is called vertical axis wind turbine. 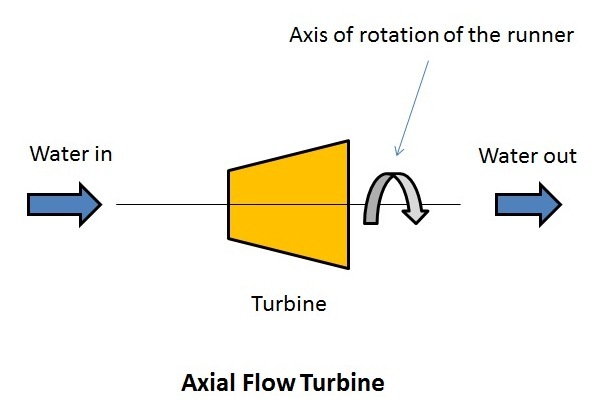 In other words, if the axis of rotation of the turbine blades are vertical to the ground than the turbine is known as vertical axis wind turbine. This is all about the different types of turbine. If you find anything missing or incorrect than don’t forget to comment us. And if you enjoy the article than like and share us. ← What is Thermal Stress in Strength of Materials?